﻿﻿﻿﻿﻿﻿﻿﻿﻿﻿﻿﻿Coastal black skimmers scoop up prey with unusual bills. ﻿As a kid growing up in Corpus Christi, no stranger to the bays and beaches, I was always fascinated by the odd-looking birds gliding along the surface of the water, with their stark black and white feathers and bright orange and black bills. Those black skimmers (Rynchops niger) are the only American representative of the three skimmer species known worldwide. 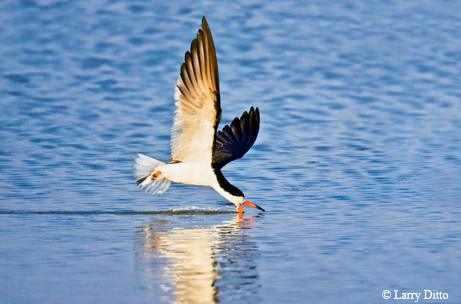 Black skimmers are found on open sandy beaches, on gravel or shell bars with sparse vegetation and in salt marshes. With its unusual bill (the lower mandible is longer than the upper mandible) and narrow wings, the black skimmer “skims” across the surface of the water, dragging its lower bill. When it makes contact with its prey, the bill reflexively snaps shut. Black skimmers are thought to do most of their foraging at night (nocturnal) or at dawn and dusk (crepuscular), traveling as far as five miles in search of food. The primary forage for black skimmers is small fish up to about 5 inches in length, such as herring, killfish and mullet. Small crustaceans may also be consumed. Skimmers reach maturity between 2 and 4 years of age, with most breeding adults averaging 5 to 9 years old. Breeding adults are monogamous and similar in plumage, but males are typically larger than females. Black skimmers are colonial seabirds, nesting in groups with other species like gulls and terns. Nests are really nothing more than a few shallow scrapes in the substrate made by both mates, averaging 10 inches in diameter and about an inch deep. A typical black skimmer clutch is about four eggs, with incubation lasting 21 to 25 days (incubation and brood-rearing are performed by both parents). After hatching, chicks can soon stand and move around, but do not begin to leave the nest until after the first week. The nesting period can last up to 30 days, and chicks begin to fly soon after. Though not listed as federally endangered, black skimmer populations have been on the decline for several decades in Texas; disturbance of nesting habitat is the main threat. Once skimmers are scared off their nests by any number of sources, gulls take advantage of the opportunity and ravage the unprotected eggs.